Your destination’s reputation rises and falls based on the experiences people have and the stories they tell. But how do you know exactly what people are saying? Destination marketers often measure public perception through surveys that provide useful but limited data samples. It’s difficult to consistently track your tourism destination’s performance at scale and build a convincing analysis that galvanizes your stakeholders. We’re proud to present the first Global Tourism Sentiment Index snapshot. This first-of-its-kind destination marketing report contains an analysis of 625,000,000 online conversations across 100 international tourism destinations that include some of our first TSI program partners and their chosen competitors. 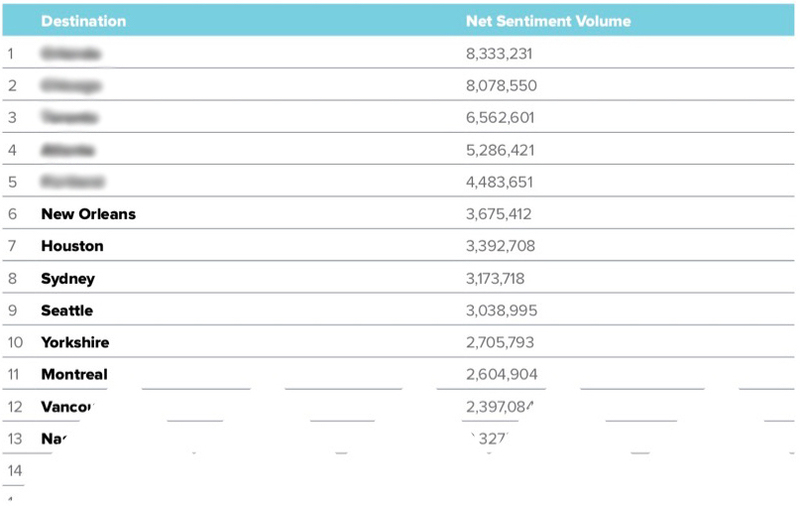 The top 15 destinations out of 100, ranked by Net Sentiment Volume. The report contains never-before-seen data for destination marketers seeking to lead their stakeholders with confidence. And it’s only the beginning. The Tourism Sentiment Index (TSI) program is growing, and in 2019, we will release a report that compares the performance of 1,000 destinations. This is becoming the lightning rod for our industry. The data is the limit, and we’ve only just begun. Get the report to see some of the first results from this exciting initiative for destination marketers, and learn how the analysis that TSI provides can help your organization.